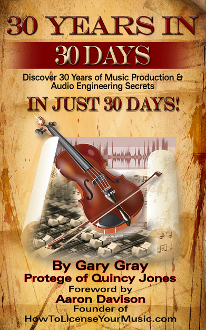 BOOK: "30 Years In 30 Days"
Contest & Products >> BOOK: "30 Years In 30 Days"
"30 YEARS IN 30 DAYS - DISCOVER 30 YEARS OF MUSIC PRODUCTION AND AUDIO ENGINEERING SECRETS - IN JUST 30 DAYS!" BY GARY GRAY, PROTEGE OF QUINCY JONES. FORWARD BY AARON DAVISON - FOUNDER OF HOWTOLICENSEYOURMUSIC.COM. THE BIBLE FOR ANYONE WHO OWNS A HOME RECORDING STUDIO AND WANTS PRO-STUDIO SOUNDING MIXES AND MASTERS.